The iridescent craze is big at The Walt Disney World Resort now! If you’re headed to Epcot try a Fountain View Crisped Rice Treat with an iridescent headband. One of the latest iridescent treats to hit the Walt Disney World Resort – this one is super fun and a nod to Mickey’s main squeeze, Minnie! It’s also the perfect to treat enjoy while wearing a pair of adorable iridescent ears yourself! Fountain View is located near Spaceship Earth and the place to grab a delicious Starbucks drink or fun treat! The pretty Crisped Rice Treat is $4.69 – or one snack credit on the Disney Dining Plan. If you’re looking for more iridescent goodness at the Walt Disney World Resort make sure you head over Disney’s Yacht and Beach Club Resorts and try a Rainbow Cookies ‘n Cream Blondie! Or make a trip to Main Street Bakery at Magic Kingdom Park for a Mermaid Cupcake. The vanilla cupcake is full of sprinkles of color and topped with sea foam green buttercream, chocolate crispy pearls, sprinkles, and an iridescent mermaid tail cookie! There are so many amazing treats to eat at the Walt Disney World Resort that you’ll want to try them all. Let one of the amazing travel experts at MickeyTravels help you plan the Disney World vacation of your dreams – and make sure you can experience all the tasty goodness for yourself! They will work with you to make sure every Magical details is though of! Click HERE for your No Obligations Free Quote (or use the form below)! 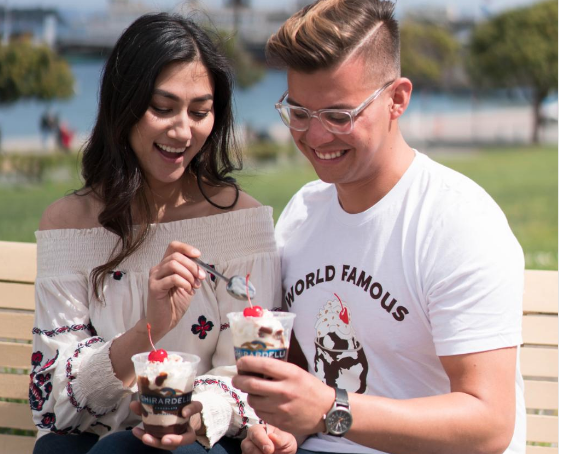 Get 50% off Ghirardelli’s World Famous Hot Fudge Sundae on July 25th!